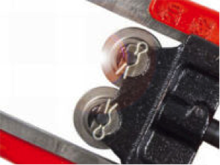 When it comes to quick and easy cut, there is nothing better than this cutter. Introducing No. 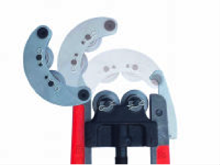 1 quick and easy steel pipe cutter for professionals around the world. Can cut only in 25mm space. (Model PCFB-25). Designed for work in area where a complete turn is impossible such as pipe against wall or ceiling. Only 130 degree swing to make a complete cut. 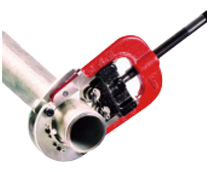 Cuts stainless steel pipes with no problems. Easy setting by quick open-close design. Wide range of capacity. From 21mm(Pipe OD) to 64mm can be cut by PCFB-50. 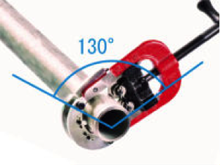 Please note that PCFB-25 is NOT equipped the bearing for cutter wheel. 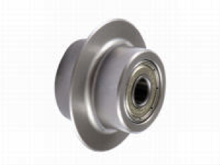 The most important part in pipe cutter is the cutter wheels. Many years of our experience in producing cutting tools let us found the best cutting edge design and the unique heat treatment that allows the cutter lasts longer than ever. 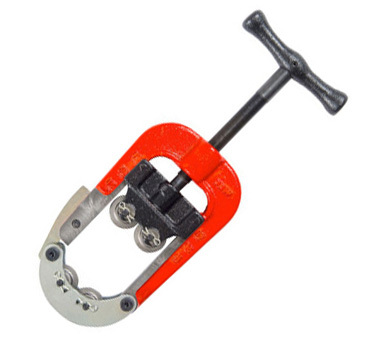 Against the conventional pipe cutters with single cutter wheel requires to turn the cutter around the pipe to compete a cut, this cutter is significantly easy to use. 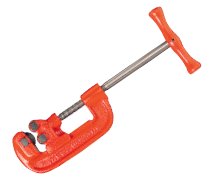 It can be perfect maneuverability for cutting a pipe in trench or against a wall where has no open space for cutter to turn around or pipe above your head where it's difficult to turn the cutter around the pipe. Latest tool should be user-friendly design and easy to use and save time, rights? MCC made it as you exactly expected how the tool should be. Once you use this quick open-close design, can't go back to the dinosaurs. It's that easy. Please note that there is no clip provided in the package of replacement cutter wheel.